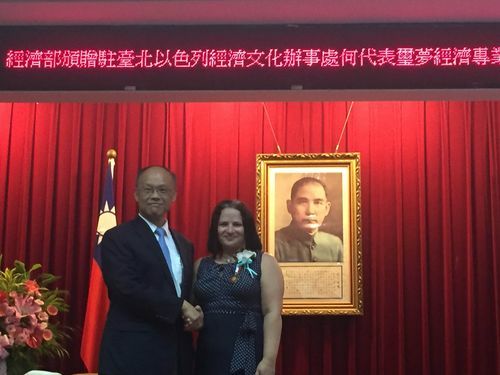 Taipei, July 8 (CNA) Israel's outgoing representative to Taiwan received a medal Wednesday from the Taiwan government in recognition of her contributions to promoting bilateral trade relations. Simona Halperin, who will complete her tenure at the end of July, received the Medal of Economic Contribution from Economics Minister John Deng (鄧振中) in recognition of her efforts to advance official and private trade exchanges between the two countries in recent years, the Ministry of Economic Affairs said in a statement. Halperin took up the post as the head of the Israel Economic and Cultural Office in Taipei in August 2010. Bilateral trade between Taiwan and Israel has increased by 9 percent since 2010 to reach US$1.33 billion in 2014, the Israeli office said in a statement. Halperin expressed gratitude for the support of representatives from various sectors in Taiwan to strengthen bilateral cooperation in trade, according to the statement. 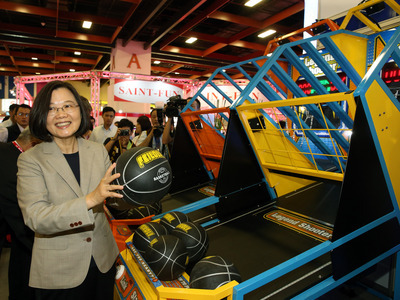 During her five-year term in Taiwan, she has signed more than 10 memorandums of understanding and agreements with her Taiwanese counterparts to promote bilateral cooperation in areas such as water technology and aviation. She was also the driving force behind a visa waiver program between Taiwan and Israel, which was launched in 2011 and has boosted tourism exchanges. Taiwanese tourist visits to Israel rose from 2,100 in 2010 to 6,300 in 2014, the office said. At Wednesday's ceremony, Halperin said she felt sad to be leaving Taiwan soon and appreciated the friendship between Taiwan and Israel. Halperin is one of the most active members in the foreign diplomatic corps in Taiwan.